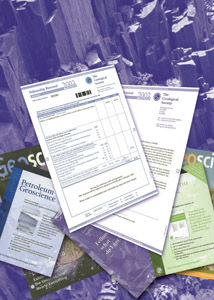 The Geological Society has significantly reduced the workload associated with its annual membership renewal process by using scannable forms designed and printed by Walsall-based Kendata Print Services, the specialist supplier of forms for automated data-entry systems. Each November, the Geological Society is faced with the job of sending out membership renewal invoices to every one of its 9000-plus Fellows. Until 2000, this work was carried out internally by the Society's accounts department, but, according to Fellowship Services Manager, Judi Lakin, the membership was growing steadily and it was simply becoming too large a task. "It used to tie up printers in the accounts office for far too long," she said, "and, to be honest, the design of the renewal invoices themselves left a lot to be desired." At that point, the Society decided to call in some outside help. Although several suppliers were evaluated, Kendata had the edge as it had already produced a detailed questionnaire for the Society some time before and had developed a good understanding of the organisation's needs. Working closely with the Society, Kendata's design team came up with a 2-colour, double-sided A4 form, with a letter and brief questionnaire on one side and a barcode and all the financial information on the other side. The new membership renewal form made an immediate impact, as Judi Lakin explained: "Kendata's design ideas were quite simple, but, somehow, as soon as they got involved, the form just looked so much more professional. I am sure this has a very positive effect and helps Fellows to feel they are part of an organisation that does things in a business-like way. " At the printing stage, each form is automatically personalised by Kendata using membership information supplied by the Society. When Fellows return the completed forms, the Society's accounts staff scan the membership-number barcode, key in any changes made on the form, and record the payment details. In order to save time on the processing of the forms, the Society can make use of Kendata's bureau service for scanning in the replies to short questionnaires if they wish. Kendata performs quality assurance checks on the data, in accordance with the requirements of BS6001, and then sends the results back in a format compatible with the Geological Society database. "All in all, we are very satisfied with the service Kendata has given us," concluded Judi Lakin. "As well as offering expertise in form design, printing and scanning, they are quite amenable whenever we have to make last-minute alterations, which inevitably does happen from time to time."